With four books and more than sixty articles in print, John Thomas is known internationally for his research on various aspects of public management and public policy. Much of that research focuses on how citizens connect with their governments and how those connections can be improved. 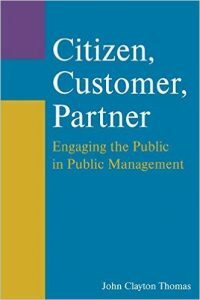 This research recently culminated in the book, Citizen, Customer, Partner: Engaging the Public in Public Management (M. E. Sharpe, 2012), in which Dr. Thomas argues that citizens interact with government in three distinct, but overlapping roles: as citizens and customers and partners. The book is designed to help students, practitioners, and scholars understand when and how the public should be integrated into the practice of public administration. Anyone may preview and go inside the text by clicking here or visiting: http://wdn.ipublishcentral.net/sharpe/viewinside/28200909927235. Copies may be purchased at a 20% discount by clicking here or visiting http://tinyurl.com/CitizenCustomerPartner and entering discount code CAT11 in the shopping cart. 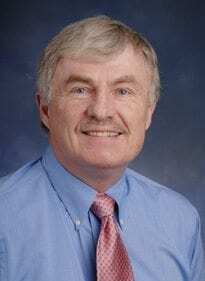 Dr. Thomas is working on a new book focused on leadership in public service. The working title is Leading and Managing the Public Realm: A Practical Strategy for Public-Minded Administrators. Dr. Thomas has conducted applied research and training on public involvement, citizen surveys, and performance measurement in a variety of settings. He has worked with state and local governments and nonprofit agencies in Colorado, Georgia, Kansas, Missouri, New York, Pennsylvania, South Carolina, Tennessee, and Texas. Dr. Thomas’s research has appeared in Public Administration Review, the Journal of Public Administration Research and Theory, Administration & Society, Urban Affairs Review, and the Journal of Urban Affairs, among other journals. He also serves as one of two Co-editors of the American Review of Public Administration, one of the elite journals in public administration.